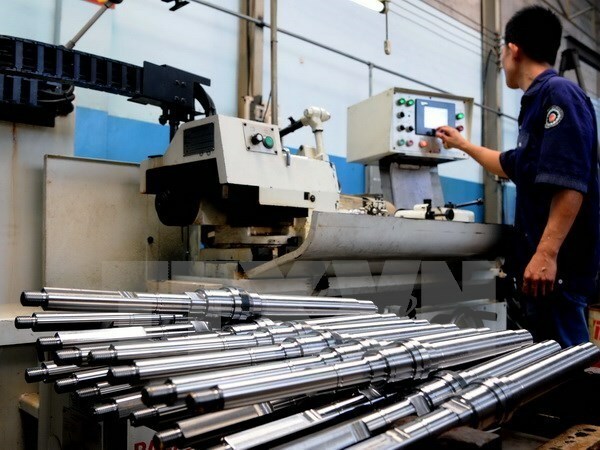 Hanoi (VNA) - Vietnam’s Index of Industrial Production (IIP) posted a 6.5 percent year-on-year increase in the first seven months of the year, according to the General Statistics Office (GSO). But GSO experts said it was lower than the 7.2 percent rate in the first seven months of 2016. They also warned that the growth of the national IIP in the first seven months was not sustainable because the index of inventory rose by 10.4 percent year-on-year, higher than the inventory index of 10.2 percent in the first seven months of 2016. According to the GSO figures, the IIP of the manufacturing and processing sector rose by 10.6 percent over the same period last year. However, the mining sector, one of key industrial production sectors, saw a 7.5 percent IIP drop during the first seven months. Several production sectors surged on the IIP, including metal production (35.4 percent), electronics, computer and optical products (15.2 percent), and paper production (10.4 percent). Output of some industrial products reached high growth during this period, such as televisions, up by 36.6 percent to 5.98 million units; rolled steel products, up 25.2 percent to 3.6 million tonnes; urea fertilizer products, up 15.2 percent to 1.42 million tonnes; and electricity, up 8.2 percent to 108 billion KWh. Many other products experienced lower growth or reduction in output, including motorbikes, coal, mobile phones, auto, crude oil and gas.